Help : Create invoice for Request Type with optional Request Group, Category for Business Partner. If the used product for invoicing is not defined, the product defined in the parameter is used. This process invoices Requests according to the Request Type provided (Invoiced type) and with status Closed (according to status configuration) and must be Invoiced. 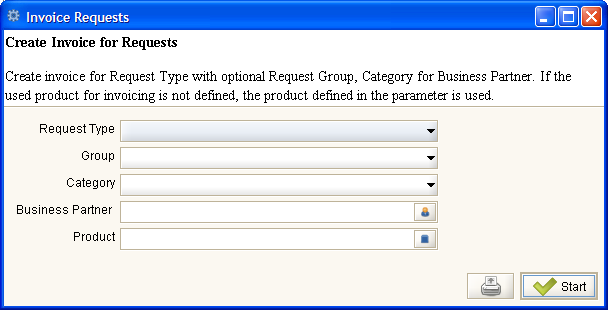 It groups request by Business Partner, obtaining spent products from Request Updates, according to invoiced quantity. One invoice for every Business Partner with lines for spent products. Last used product and quantity stays fixed in Request, when customer makes an update - even via web. So, customer added records also invoice products notwithstanding the customer hasn't added those products. Relation between Invoice and Request Update is not registered, as a suggestion it could be filled on invoice or line descriptions pointing to the corresponding request. (Solution here).